Years ago I purchased a small hand-held vegetable spiral cutter. After using it a couple of times, I decided it was more trouble than it was worth, so into the back of the cupboard it went. Eventually, it was donated. All of a sudden, ‘spiralizing’ vegetables has become the RAGE! Recipes for spiralized you-name-it, are popping up all over social media, in blogs, cookbooks, and so on. Heck, even our local Italian restaurant offers spiralized zucchini in place of spaghetti! The last time we dined there, I substituted the spahghetti with the zucchini 'noodles' with my meal and enjoyed it immensely. 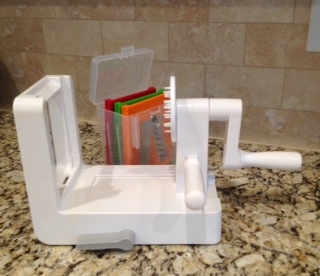 I thought long-and-hard about ordering another spiralizer, and decided, why not. One click on Amazon, and 2 days later my tabletop gadget arrived. This time, I got a spiffy model (hey, I deserve it!). It adheres to my counter top beautifully, cranks easily, and produces a mountain of curly, verrrrry long strands of goodness. 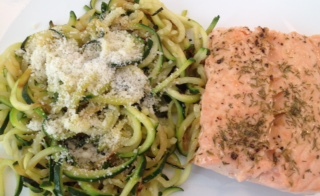 When it came time to prepare dinner the other night I didn’t have a particular recipe in mind, but here’s what I made - poached salmon with a side of sautéed zucchini ‘noodles’. I made spirals out of 2 medium-sized zucchini and quickly sautéed them in a large-enough skillet with just a splash of olive oil and a dash of salt and pepper. For added flavor, I sprinkled on a bit of Parmesan cheese. The skinless salmon filet was seasoned with salt and pepper and poached in white wine with a squeeze of lemon juice. Dried dill was sprinkled on top just before serving. In no time, we had a quick, satisfying, and delicious meal! What’s next with the spiralizer? I’ll be experimenting with sweet potatoes!